Enjoying the view with the right answer were Cheryl and Anne. We are staying in the Yorkshire Dales for this week's Sunday Snap of a Victorian railway viaduct. This forms part of 73 mile line that runs through Yorkshire into Lancashire and then Cumbria. The Ribbleshead Viaduct was started in 1869 and finished in 1874 before finally opening in 1876. It took over 2,300 men to construct this viaduct. It was one of the last to be built using primarily manual labour. With so many workers to accommodate they lived in harsh conditions in makeshift dwellings. 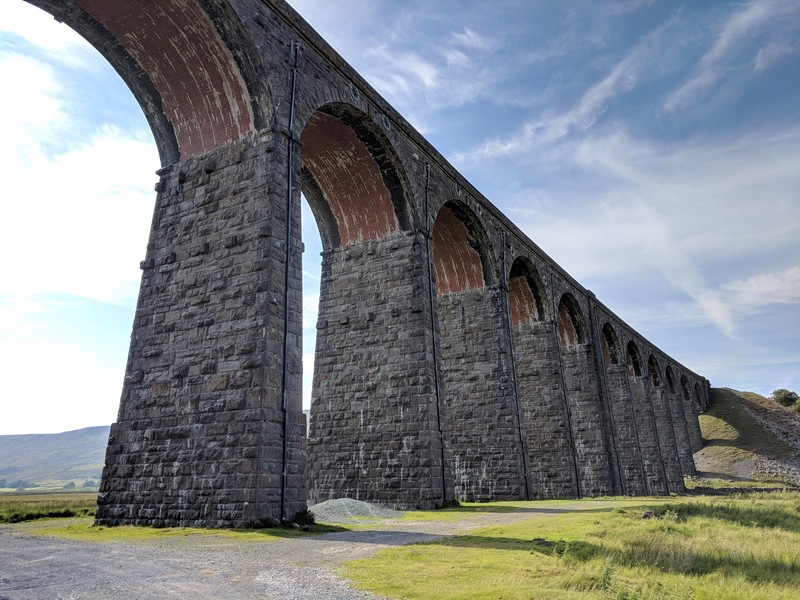 With few health and safety rules, an outbreak of smallpox, challenging conditions in such a remote location and the sheer scale of the build around 100 men died during the construction of the viaduct. The Ribbleshead Viaduct is 400m long and stands 32m above the valley floor at its highest point. The location itself is 300m above sea level. In the 1980s the line became a single track across the viaduct to stop damage from two trains going over at the same time. Now famous for his television programmes on rail travel, Michael Portillo, states it was his great political achievement to reject plans to close the line. As Minister of State for Transport he rejected British Rail's plan to close the line in the late 1980s. He is now president of the user and support group that helps to preserve the line. Today the route provides a valuable link for commuters and tourists between Yorkshire and Cumbria plus is used for freight traffic. What railway route is the Ribblehead Viaduct on? We were joined last week by Susan and bouncing balls. Sara favourite things this week include a rose bouquet, a dramatic sunset and a dancing dinosaur. Catch of the day by Cheryl's son was rewarded by the bottle of Champagne. In Bournville Anne has been listening to the bells being played. Betty has been looking back in her New Zealand archives. Finally, Jesh has been spotting burnt sienna everywhere. If you want to join in with this week's Sunday Snap then add your link to the linky below. Any theme is allowed. It doesn't have to be published today as you have until 23.55 on Friday 28th September 2018 to join in. Grab my badge below for your blog post. Just make sure it is your photo and you hold the copyright for it. I don't know the answer and I don't think I've seen a viaduct this big before. What a shame so many died while it was being built. I guess there is a lot of sense in our health and safety rules these days. Love your viaduct. It has a lot of character.